What is the distance between the two points A(-5,7) and B(3,10). The points (-5,v) and (-2,w) are on a line parallel to . What is the value of ? 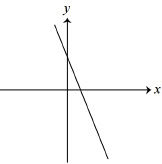 A line intersects the positive x-axis and positive y-axis as shown. 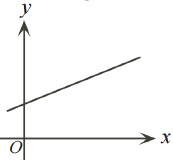 Which of the following is a possible equation of this line? 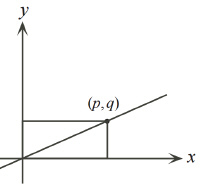 The point (p,q) is one the line as shown. If the area of the rectangle is 105, then what is the value of “p”? Given that the coordinates (m,n) lie on the line . Which of the following coordinates would also be on the line? 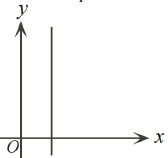 Which of the following graph has a slope of zero? Given that the points A(1,2), B(4,3), and C(-2,-3) are three vertices of a parallelogram. Which of the following can be a coordinate of a fourth vertex? If “x” and “y” are positive integers with , then the largest possible value of is?